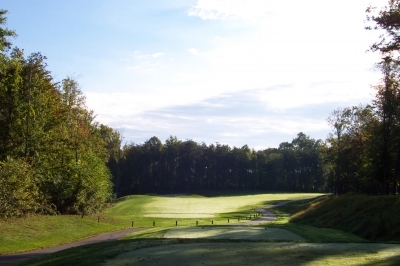 BALTIMORE, MD � The folks at The Woodlands Golf Course (about 20 minutes west of downtown Baltimore) want you to walk away in disbelief. Looking back from the Woodlands' 17th green. The second shot to this par five defines risk-reward. It is, but it�s also well deserved, when you�re talking about this Lindsay Ervin design carved out of some beautiful Maryland countryside that opened in the summer of 1998. Public golf, especially publicly owned golf, carries with it a plethora of negative stereotypical baggage. Since the common good owns the facilities, you�re usually looking at a -- for a lack of a better way to put it -- more �bureaucratic� golf experience when you visit such a place. 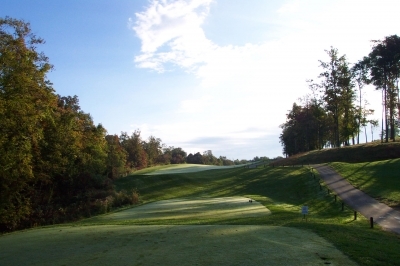 Tee times at many �munis� are hard to come by, the service is non-existent, the conditions are sparse, the golf is somewhat boring, and often it takes forever to get around the eighteen holes. It�s what you come to expect from the �muni� reputation (after all, the rap was earned in some way, right? ), but you also save money in the process. A good many of us grew up with this golf situation, paying $1.50 for the privilege of playing after two o�clock on hot summer weekdays at the course down the street. As teenagers, my friends & I used to get out three times a week for the price of a movie, but the course wasn�t anything to write home about. Early morning shadows obscure the tee shot landing area on the par four 4th hole. You can�t quite get The Woodlands for that fare, but you�ll still pay less than at most upscale public or semi-private golf clubs in the Baltimore/Washington area. And the largest departure from the �munis� of the old days isn�t just the money exchanged, it�s the quality of the layout. The Woodlands isn�t part of a housing development, it�s very thoughtful and challenging, and the conditions are a good bet for the buck. 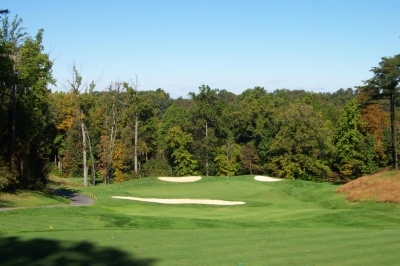 It�s a darn fine golf course, one of the best kept secrets in the Mid-Atlantic. �This isn�t a golf course for someone who�s having a hard time keeping the ball in play,� Rahnis adds. 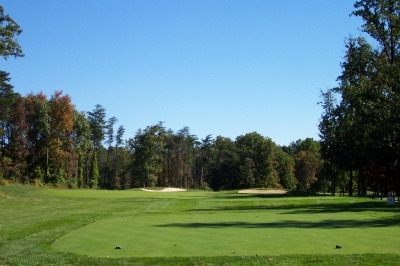 They came up with the name �Woodlands� for a reason, certainly alluding to the fact that nearly every hole is closely guarded by mature hardwood forest. Like spectators at a PGA Tournament, the trees are lining the links � but if you hit into them, you�re probably not coming out with your golf ball. At 173-yards and downhill, the par three 14th hole plays the shortest on the course -- but the green still won't give up many easy birdies. In addition to the horizontal difficulties, the greens are severely sloped and very tricky. They were in terrific shape and the ball rolled true, but we often stared bogey in the eye, having originally dreamed of birdie when getting there in regulation. 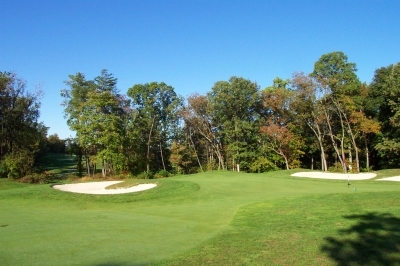 The Woodlands� greens were so contoured it seemed the course was specifically designed to play for tournament conditions. It�s hard to imagine the average weekend hack putting those slopes on a regular basis. Compound that with a tee sheet full of weekend hacks (myself included in this group), and you�re looking at potential pace-of-play problems. The green on the par four 7th hole is very wide, but not very deep. The hole measures only 364 yards, so it'll be quite a test of your short iron shot-making. Sounds like common sense. The day we played all the greens rolled plenty fast � but to the club�s credit, the marshals still kept things moving along well. Rahnis says they�ve got two player assistants out there at any one time, helping people keep pace by finding wayward golf balls, raking bunkers, whatever�s needed to make sure the arteries don�t clot. 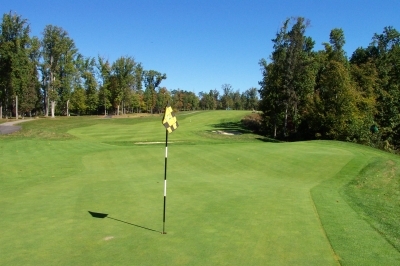 That�s another non-muni benefit you�ll find at The Woodlands. 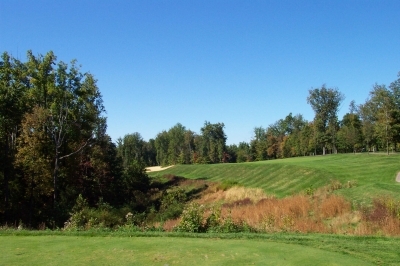 Common sense also prevailed when the course was built, along with the Woodlands� sister course, Greystone, a bit farther north but with a similar �I can�t believe this is a public course� quality to it. Try and clear the bunker on the right off the tee of the par four 16th hole -- if you succeed, it's a short pitch to the green. Ervin said there were a couple dominant considerations influencing his design at The Woodlands. First, while the site itself contained plenty of land for a golf course (185 acres), there were local environmental restrictions that limited the use of the land. The regulations mandated up to a 150-foot set-back from streams, so the actual useable acreage was significantly less � which squeezes the course a bit in spots. The next difficulty was logistical. �For obvious reasons, we had to place the first tee and eighteenth green near to the existing clubhouse � and due to the set-back limitations from a stream that was somewhat close to the parking lot, we were a bit cramped for space on those holes, which restricted the character of their design,� Ervin added. The par four 9th hole is one of the few at The Woodlands where there's plenty of room off the tee. But at 454 yards, you'll need two solid shots to get to this point. The first tee is a tad narrow, and the eighteenth hole is a bit short for a closing hole at 361 yards, but until Ervin mentioned this, it was difficult to tell anything was restricted at all. In other words, they did a pretty solid job hiding any �abnormalities� in the design. Ervin also mentioned that a few blind shots were created when they weren�t able to cut as much as they would�ve liked because of the rocky nature of the site. Blasting could�ve taken care of the problem, but it�s expensive and time-consuming. As a result, they had to leave the land as it was (in places) to accommodate the golf holes. 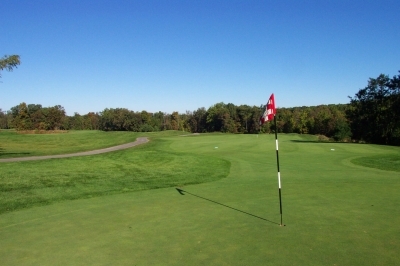 Again, to their credit, visibility is not a problem at The Woodlands � there are a couple tee shots where you�ll have to trust existence of the landing area, but overall you�ll see everything very well. There's a mild carry off the tee on the short par four 18th hole. Many courses could make a similar claim, but Rahnis has got a point about The Woodlands. The forest is pretty dense in most spots (which doesn�t exactly aid in finding lost golf balls), so it�s no exaggeration that you won�t be able to see the hole next to you � and you also won�t hear it, either. Pure golf solitude. We finished in about four hours on a Sunday, even including the putting issues and several trips into the �woodlands� to try and locate golf balls. The overall service, though present, isn�t at a level you�ll get at the tip-top upscale courses, but then again, it�s not intended to be. They probably could provide more, but you�d be paying for it. We found the on-course marshals, clubhouse staff and starter to give us what we needed � we�ll just have to clean our own clubs, and that�s okay. 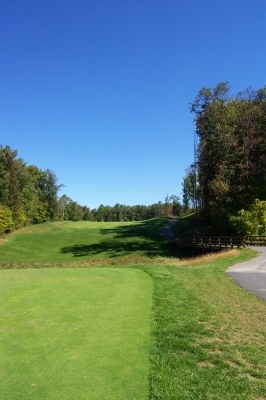 Highlights on the course include the second hole, a 195-yard, downhill par three. The first two holes are relatively �open,� and the second hole�s backdrop is the most beautiful on the course. It�s good golf too, as the green�s designed to test your shot-making skills. As is the case with most of The Woodlands� holes, being short won�t hurt as much as going long (and the bunkers, if you�re in them, aren�t overly deep). Looking from the tee on the par five 17th hole. The ravine makes the carry look farther than it plays. The landing area is blind, but it's still well defined. The seventeenth hole is one of the more unique par fives you�ll ever see. 538-yards from the tips, it�s risk-reward all the way, from tee to green. The hole doglegs sharply from right to left, and your first decision is what club to use off the tee. You�ll need to clear a ravine, but how much of the leg you want to cut off is up to you. Factor in a potentially reachable second shot � with a downhill lie, no less � and it�s a hole you�ll certainly remember. 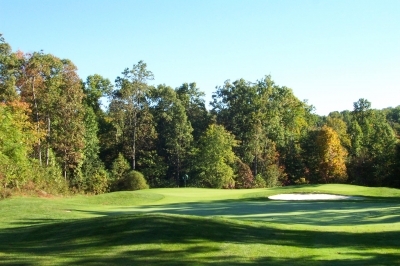 Seventeen green is also one of the more notorious on a course with a number of �unique� putting surfaces. The day we played the pin was back on a narrow tongue, but you could still hold the ball below the hole. If the pin�s up front here, it�s impossible to get it close. Whatever your conclusions about the greens, you�ll certainly find it worthwhile to play The Woodlands. It�s beautiful, well maintained, and a good value. So much so, you�ll instantly become a disbeliever. A severely sloped green mandates accuracy on the par three 8th hole. Note: Check links below for more reviews of courses in the Baltimore/Washington area. Winter -- Weekdays, M-F: $36, with cart. Weekends & Holidays, $48, with cart. Senior, Junior, Early Bird and Twilight rates available at various times of the year. Consult the website for a complete list of rates. Fee for range balls. High season starts the first Monday in April. Consult the website for rates.